On April 17, 2019, Indonesians will head to the polls to partake in another much-anticipated general election. In an attempt to curb the spread of radicalism through sermons at mosques, the Indonesian Ulema Council (MUI) will provide preachers with training on moderation and nationalist Islam. Maritime Affairs and Fisheries Minister Susi Pudjiastuti lambasted the Vietnam Fisheries Resources Surveillance (VFRS) agency for allegedly disrupting the Indonesian Navy’s efforts to seize four Vietnam-flagged vessels for illegally fishing in Indonesian waters. Over the trial period, GET completed 2 million transactions covering 80 per cent of Bangkok and aims to cover the entire city soon. Travel-booking giant Traveloka, one of Indonesia’s four start-up unicorns, announced on Wednesday (27/02) it has expanded its operations to Australia. Indonesian authorities on Wednesday ramped up efforts to find 37 people feared buried by the collapse of an illegal gold mine on the island of Sulawesi that killed at least four people. The head of the anticorruption body has suggested that the number of corruption cases involving politicians would decline if the government increased state funding for parties. A broadcasting commission in Indonesia has placed a ban on more than a dozen English songs that authorities say contain adult and offensive content, the Guardian reports. Kredivo, a digital credit card for millennials in Indonesia, announced its partnership with Moka, a local digital point-of-sale company. Consumers can pay for offline purchases using Kredivo cards in retail stores equipped with Moka devices. A planned ministerial rule revision intended to pave way for consolidation in Indonesia’s telecommunication industry won’t be enough to spark deal activity, according to analysts at Citigroup Inc., PT Danareksa Sekuritas and PT Yuanta Securities. Unicorn startups continue to be Indonesia’s talk of the town, especially the major investments obtained by these tech-companies valued at a minimum of US$1 billion. Indonesia’s annual inflation rate probably cooled for a third month in February, as food and pump prices fell, a Reuters poll showed on Wednesday. Foreign Minister Retno Marsudi stated at the 40th session of the United Nations Human Rights Council (UNHRC) that Indonesia is a reliable partner for democracy, development, and social justice. Indonesian officials said on Wednesday dozens of rescuers were using spades and ropes to dig out around 45 people who were feared buried by the collapse of an illegal gold mine on the island of Sulawesi that killed at least one person. Indonesia emerged as the winner of the AFF U-22 Championships after beating Thailand 2-1 in the finals at the Phnom Penh National Stadium on Tuesday night. The head of Indonesian President Joko Widodo’s re-election campaign said on Wednesday supporters should not be complacent over the incumbent’s lead in opinion polls, given the high number of undecided voters and threat of fake news. Home Affairs Ministry’s Director General of Population and Civil Registration Zudan Arif Fakrulloh gave an official clarification regarding the rumor of a foreign national listed in the final voter list (DPT) for the 2019 election. President Joko Widodo (Jokowi) discussed policies on land use in forest areas, with the aim of providing legal protection to the small people. In the Indonesian capital there are people toting guitars, singing and playing music on almost every street corner. The archipelago has a strong popular music history, and has nurtured talented groups in all sorts of genres, from hip-hop to heavy metal, and from punk rock to jazz. An illegal gold mine in Indonesia has collapsed and buried dozens of people who are “screaming for help,” according to a disaster management official at the mine, where three people were confirmed dead. Tens of gold miners were buried in a mining site at Bakan Village, Bolaang Mongondow District, North Sulawesi Province, according to the National Disaster Mitigation Board (BNPB). Wheat imports by Indonesia, the world’s No.2 buyer of the grain, are likely to be pressured in 2019 by reduced appetite for the commodity from animal feed makers, a top official at the country’s biggest milling company said on Wednesday. Over 300 people crowded the lobby of telecommunications company Pasifik Satelit Nusantara (PSN) in South Jakarta at 8:30 a.m. on Friday. In a bid to support tourism and the local economy, especially in West Sumatra, national flag carrier Garuda Indonesia has announced that it will lower its ticket prices for the Jakarta-Padang route starting on Thursday. The Indonesian Counterterrorism Agency (BNPT) Chief Suardi Alius and the Egyptian Minister of Interior Mahmoud Tawfik signed a memorandum of understanding (MoU) upon battling the terrorism on Tuesday, February 26, in Cairo. Intellasia East Asia News The Indonesian military deployed an aircraft to create artificial rain on Monday (February 25) as thick smog caused by forest fires forced schools to close on Sumatra island, officials said. 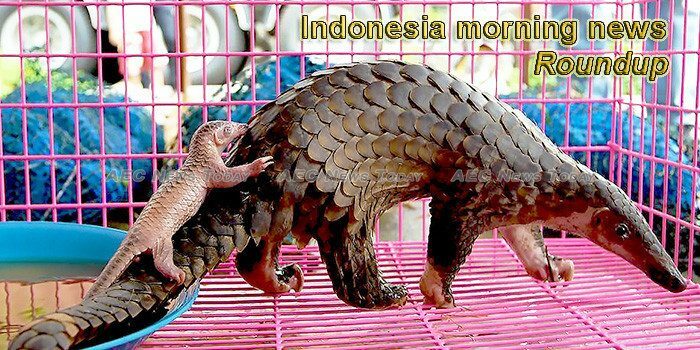 This week’s Indonesia morning news feature photo acknowledges World Wildlife Day, March 3.